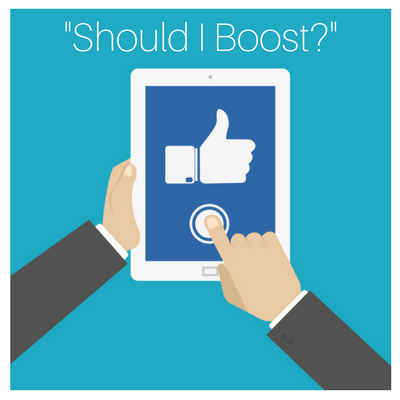 Do NOT press the boost button on Facbeook - You're losing money! Have you ever pressed the boost button on Facebook and thought it’s gone amazingly well? You’ve seen 1000 people for $20, crazy! Sorry to break it to you but our number 1 tip that we give to anyone that is trying to manage their own social media accounts is don’t press that big, blue, tempting boost button. Facebook is one of the largest companies in the world for a reason. Currently valued at almost $500 Billion. They know the ins and outs of all of our brains and know exactly how to attract us. They have created a beautiful, blue button that follows you everywhere for a reason. The only way that Facebook generates money is via their ads. Therefore, they want to make sure that it is being used regularly and that people are spending on it. How do I get results then?! You’re probably freaking out right now. Especially if you’ve heard about the ever continuing changes to Facebooks algorithm and people that are paying getting rewarded. Don’t worry, we have a solution and it’s amazing. All you need to do is head to a website called www.business.facebook.com. Once you’re there, it’s quite a simple process. However, it can be confusing so if you need any help at all contact us and we can walk you through it! The power of this simple change can save you by hundreds even thousands of dollars in the long run. On average you should be spending NO more then $3-4 per 1000 people! If worked and tested correctly you can see incredible results, as I mentioned we have run ads at Prestige that have seen 250,000 local people, received 20,000+ comments and 10,000+ likes! It’s your turn now, head over to business.facebook.com and check it out! If you are struggling to work it out or have no idea who to target or what you want to achieve, contact us! For a limited time we are offering free strategy sessions to help people get their business in the right direction and sky rocketing towards their business goals.